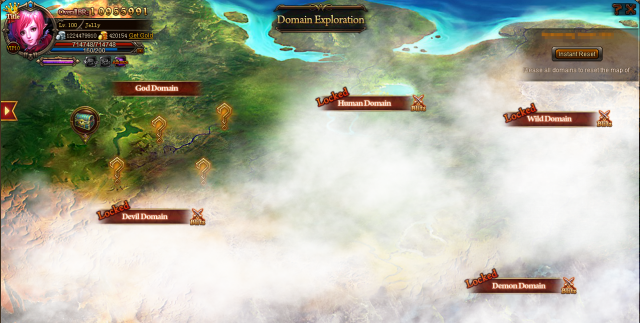 North America Forum»Forum ›Knights Fable ›News and Announceme... › Domain Exploration! Five domains are covered by smog. Now time to lift the veil of the mysterious lands and set your steps there. 1.This function unlocks at level 50. 2.There are five domains: from Devil Domain, Human Domain, Wild Domain, Demon Domain to God Domain, the difficulty grows. Wisdom is needed to unlock each domain. 3.When players are stuck at certain events,they can use wisdom to reset the map and restart the challenge. 4.Domain of higher difficulty has higher chance to unlock Mara. 5.Players will get points when completing domain events. Higher points grant better rewards. 6.Players can blitz the domain after it is cleared. The blitz cannot be operated when any of the domain remain unfinished. 7.The blitz will be stopped once Mara appears. Players need to challenge Mara manually. 8.The level of Mara is determined by the level of its discoverer, and the level difference will be no more than 10. 9.Players can use Silver Boost or Gold Boost to enhance their BR when challenging the Mara. 10.When Mara appears, its discoverer can fight it alone, and can also seek assistance from other players of the same server. Every player can challenge Mara at most 3 times per day. 11.The level difference of Mara and its challengers cannot exceed 10 levels. 12.Players will get Mara damage rank reward after Mara is killed. Players who give the last hit will receive last hit reward. Both rewards are sent via in-game mail. 13.Domain will be reset every day at 0:00,including the challenge process and point reward. Please claim point rewards timely. Collect enough materials to upgrade your gears! 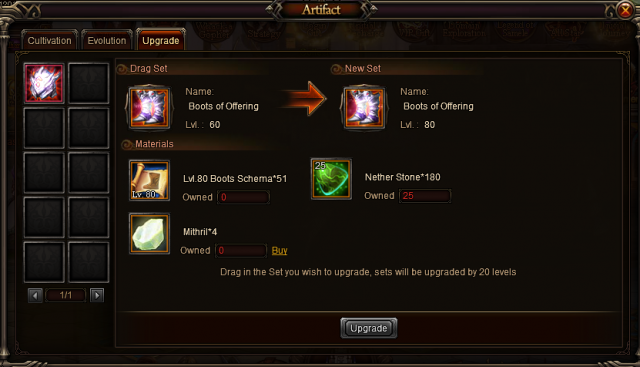 Now only Lvl.60 forged gears and artifacts can be upgraded to Lvl.80. Do not forget to unequip the gear you want to upgrade. [colorNow, feel free to reply this thread with your ign and server attached if you find any bugs or get any suggestions. Players with solid bugs or useful suggestions will receive 100-200 gold in game as reward! U failed to mention it uses stamina . Would have been nice to know that you\'re actually fighting players from your server, which is kind of dumb and unfair, as I tried two different difficulties and got stuck on the same person on each difficulty (4 star and 3 star) for the second fight, how am I supposed to get anywhere if that\'s going to be a common occurrence. Change the stamina on treasure opening to a 5 not 7 or whatever it is, hate the uneven stamina amount it gave me now. And is it really necessary for every fight to cost stamina? Maybe just the Mara one can cost stamina and possibly treasure opening too. Or instead of using wisdom to open the domain just make it a set stamina base like maze. Another suggestion, I\'m not sure if we\'ll be getting schematics in future events or they will be put into shops, but if not 80 is going to take forever to accumulate per piece and on top of that it\'s random so could take even longer to get what you need. On the other hand I haven\'t seen any bugs so far but it\'s hard to tell with what little time I got to have with it. I still don\'t see the domain exploration feature. 2019-4-22 00:45 GMT+8 , Processed in 0.059560 second(s), 52 queries .